Sorensonmedia hat ein Update für Sorenson Squeeze veröffentlicht. Die Aktualisierung mit Versionsnummer 4.5.3 enthält einige Verbesserungen und ist für Besitzer der Version 4.5 kostenlos. The latest update to the company’s award-winning software adds two new features and enhances the quality of compression and encoding of version 4.5. 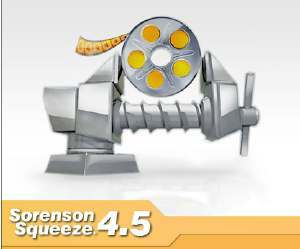 Sorenson Squeeze 4.5.3 contains an error log feature for batch encoding that displays the name of any file with an error and error information as Sorenson Squeeze continues on to encode the entire batch of files. Users can save the error log text file and send it to Sorenson Media for help diagnosing encoding problems. The latest update also expands the 32-character file name limit to 63, which is the maximum QuickTime can accept. Maintenance items on version 4.5.3 include support for encoding alpha channels while scaling; allowing Sorenson Squeeze versions 4.3 and 4.5 to coexist on same hard drive; eliminating pops and clicks on MP3 audio; adding a more robust filter in the Noise Reduction feature, and stopping a memory leak in Apple’s H.264.